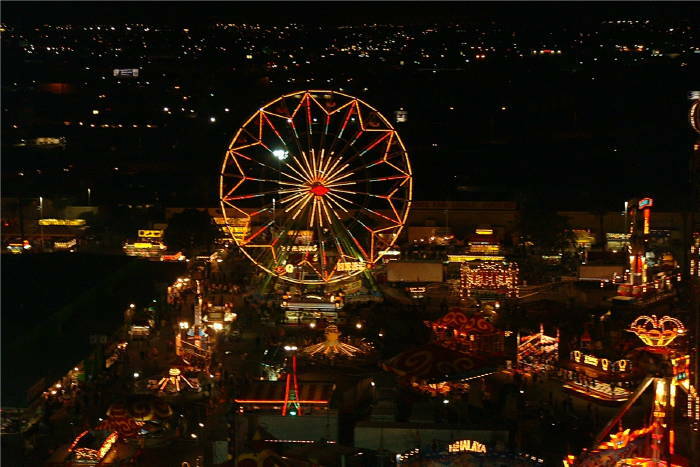 The Arizona State Fair 2014 festival will be one of the biggest carnivals in the US with over 1,100,000 expected to attend the Phoenix, AZ event. The festivities include great concert series, contests, concerts and much more. The Fair’s history spans three centuries. It was 128 years ago, in the territorial days before statehood, when Arizonans first began coming together to show their best livestock, share their agricultural accomplishments, and have fun. To aid the Association with their 80-acre development, the Territory of Arizona created a Fair Commission. With a legislative appropriation of $22,500, the Commission constructed two buildings on the property. The 2012 Arizona State Fair preserves the best of the Fair’s traditions, while moving forward with 21st century innovations in technologies for education and entertainment. This year’s Fair marks the 67th consecutive time Arizonans have celebrated with an annual State Fair. Reviving the Fair became the mission of a citizens’ group which formed the Arizona Territorial Fair Association in 1905. Financed by its members, the group led by hotelier J.C. Adams purchased the present location for $9,200. The Association immediately developed the property, adding two racetracks, a grandstand, and a wooden fence around the grounds. In November of 1884, a group of citizens in the territory of Arizona wanted to organize an event with the family in mind. The very first Arizona Territorial Fair was held in Phoenix in late fall, near the Salt River west of Central Avenue. Fairgoers of the day were treated to horse, pony, and mule races along with exhibits including agriculture, home economics, and dairy and beef cattle. Fairs were held here annually until 1891, when the untamed Salt River flooded and destroyed the site’s buildings and racetrack. After renting the property from the Fair Association for $10 a year, the Fair Commission purchased the property in 1909 for $30,000. With statehood granted in 1912, the State Fair Commission continued the work of the Territorial Fair Commission in presenting the annual Fair. With the exceptions of 1921 (cotton crop failure), 1934 to 1939 (Depression era), and 1943 to 1945 (World War II), the Fair has been presented yearly. The Arizona State Fair festival is an annual state fair, held at a permanent fairgrounds in Phoenix, Arizona. It was first held in 1884, but has had various interruptions due to cotton crop failure, the Great Depression era, and World War II years. Since 1946, the fair has been held regularly each year. It was a territory fair before Arizona was a state. The Arizona Exposition and State Fair is a self-supporting state agency, and receives all the monies from the state’s General Fund. The fairgrounds serve as a host facility for a number of different tradeshows, events, and entertainment. The fairgrounds is the location for the Maricopa County Fair, the Arizona National Livestock Show, the Maricopa Home and Garden Show, and more. 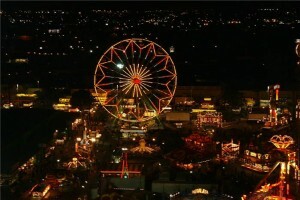 The Arizona Fair typically has around 75 carnival rides, 110 food booths, and 300 commercial sales booths. 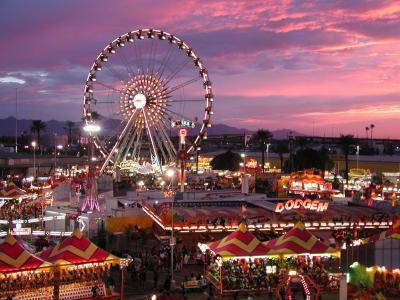 The Arizona State Fair is one of the top 5 state fairs in the country drawing well over a million visitors annually. The origins of the Arizona State fair start in 1884, when residents of the Arizona Territory organized the Arizona Territorial Fair to provide family entertainment. The fair was held near the banks of the Salt River, just west of Central Avenue. Entertainment included horse, pony and mule races, while agriculture, cattle (dairy and beef) and home economics were the common exhibits. The Territorial Fair continued annually at this location until 1891 when the Salt River flooded and wiped out the buildings and racetracks. Fair attendance was an all-time high of 1,303,690 over the 21-day period running from October 13 – November 5. Formed as a way to share native culture and dance with the world, the dancers represent various nations from all across the United States and Canada. Performing daily. Read 3 books, get 3 carnival rides FREE! Visit the Great American Petting Zoo in the Cattle Barn for the entire run of the fair. Experience live racing action at the Great American Duck Race! Lucky members of the audience are chosen to hold and release one of four Mallard ducks as the starting horn sounds. The “BMX Freestyle Team” is an exciting action packed Stunt Show that will leave you wanting more. This must-see-to-believe attraction is great for all ages. Watch as trained riders from here in Arizona perform freestyle stunts and tricks just like you see on the X-Games! The purpose of the Arizona High School Rodeo Association (AHSRA) is to promote high school rodeo on a statewide scale and work towards bringing statewide recognition to the sport of Rodeo. Time to get your groove on with this show where you know all the songs! See your favorite Old School artists. Arizona State Fair is the official state fair of AZ. This year is going to be a great event with festivities for the whole family; young and old alike. Arizona State Fair is rated 5 out of 5 stars! 2 Responses to "Arizona State Fair festival 2015 info"